Reproducing the exuberant and jubilant inventiveness that drove the uniqueness of an original film for its follow-up story isn’t always an easy or obtainable task. But the new adventure family sequel, ‘The Lego Movie 2: The Second Part,’ exuberantly retains the enthusiastic and inspirational message that appears in its predecessor, 2014’s ‘The Lego Movie.’ The second installment of the main ‘Lego’ film series, which Warner Bros. is releasing in 2D and 3D in theaters tomorrow, is just as entertaining, fun-loving and heart-warming as the first movie. Director Mike Mitchell, who found previous success in the animated genre with such hits as ‘Shrek Ever After’ and ‘Trolls,’ crafted another amusing, yet equally emotional, tale of the importance of friends working together to defend each other against antagonistic forces that wish to keep them apart. Set five years after the original film, ‘The Lego Movie 2: The Second Part’ follows the always cheerful and positive construction worker, Emmet Brickowski (Chris Pratt), and his fellow citizens as they contend with more seemingly immature Duplo invaders. The Lego characters’ enemies are now acting on their previous threat to destroy the protagonists’ beloved community of Bricksburg. While the Lego characters have renamed their city Apocalypseburg following its destruction by the Duplo invaders, Emmet still finds the joy in life. However, his closest friend, the fierce leader Lucy (Elizabeth Banks), is beginning to lose patience with his enduringly naive demeanor, especially after she and several of their neighbors, including Batman (Will Arnett) and Unikitty (Alison Brie), are kidnapped. The group is taken to a galaxy presided over by the shapeshifting Queen Watevra Wa-Nabi (Tiffany Haddish), who initially appears to have sinister intentions to Lucy and her neighbors. In order to save his friends, Emmet jumps on his own spacecraft and follows them. During his journey, he meets the tough and fearless pilot Rex Dangervest (also voiced by Pratt), who offers to helm him find and save his friends. Emmet immediately accepts the help, and along the way, appreciates Rex’s determination to also help him evolve into a tough fighter. As Emmet, as well as Lucy and their neighbors, diligently work to stop Queen Watevra Wa-Nabi from persuading Batman to marry her, and returning order to the once harmonious Bricksburg, the two warring worlds must find a middle ground, so that their seemingly conflicting lifestyles can co-exit. 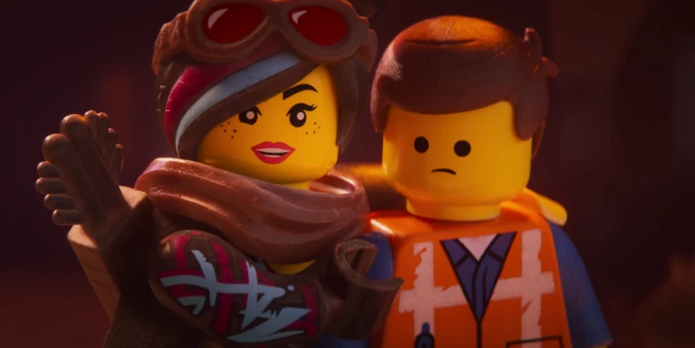 Much like its predecessor, ‘The Lego Movie 2: The Second Part’ is a high-concept animated blockbuster that uses the title toy brand to showcase how people-or in this case, toys-can realize just how special everyone truly is to each other, if they can learn how to overcome their differences. The distrust and suspicion of everyone that built up between Emmet’s community and the Duplo Invaders was the heartbreaking result of their lost capacity for communication. But as the main character learns how to be braver in his approach to getting what he wants, including bringing his best friend back home, the Lego toy walls that his community has built to protect themselves threatens to come crashing down.